Jorge Acevedo loves Jesus Christ and his Church. Touched by the grace of God at seventeen, he was never the same. Rescued from a life of addictions, his greatest delight is connecting people to Jesus and the Church. Born in Puerto Rico, Jorge at the age of four months, moved with his family to the United States where he was raised. Jorge was married to Cheryl Montgomery. Their oldest son, Daniel is married to Courtney who gave them four beautiful grandchildren, Mia, Levi, Seth and Zoe. They also have a younger son, Nathan. Jorge is the Lead Pastor at Grace Church, a multi-site, United Methodist congregation in Southwest Florida with five campuses (Cape Coral, Fort Myers Shores, Fort Myers Central, Fort Myers Trinity, and Sarasota in Southwest Florida). Grace Church is recognized as having one of the largest and most effective recovery ministries in America. From 1992 to 1996, he served as Executive Pastor at Christ Church United Methodist in Fort Lauderdale, Florida; from 1988 to 1992, as the Associate Pastor at First United Methodist Church in Kissimmee, Florida; from 1984 to 1988 as Minister of Youth and Children at Trinity Hill United Methodist Church in Lexington, Kentucky. Jorge is a 1984 graduate of Asbury College where he received a Bachelor of Arts Degree majoring in Bible. He is also a graduate of Asbury Theological Seminary with a Master of Divinity Degree. Jorge was ordained as a Deacon in the Florida Conference of the United Methodist Church in May 1986, and an Elder in May 1990. 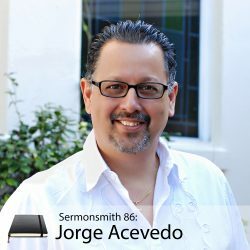 Jorge was the 2001 recipient of the Denman Evangelism Award from the Florida Annual Conference of the United Methodist Church given to a pastor for excellence in evangelism. In 2007, he was named the Distinguished Alumni of the Year at Asbury Theological Seminary. In 2009, the Foundation for Evangelism named Jorge the 2009 Distinguished Evangelist of the United Methodist Church. He was a 1996, 2000, 2004, 2008 and 2012 delegate to the Jurisdictional Conference and a 2000, 2004, 2008 and 2012 delegate to the General Conference. Jorge co-authored The Grace-Full Life: God’s All-Reaching, Soul-Saving, Character-Shaping, Never-Ending Love Abingdon Press, 2017) and Sent: Giving the Gift of Hope at Christmas (Abingdon Press, 2015). He also authored Vital: Churches Changing Communities and the World (Abingdon Press, 2013) and co-authored The Heart of Youth Ministry (Bristol House, 1989). He has also written for the United Methodist Publishing House, Circuit Rider magazine, Good News magazine and Our Faith Today.